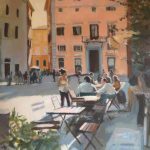 The vibrancy of everyday life in Rome has inspired my recent paintings. It is amazing what wonderful sunlight can do to your mood. 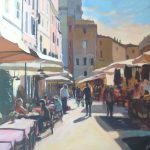 I especially loved the light in the market square, Campo de’ Fiori with lovely shadows from the stalls and the people. I can still imagine sitting down for a coffee while sketching. 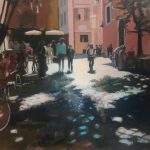 My passion for painting developed while living in the south of France with my family. This was thanks to the teaching of an amazing artist, Mitch Waite. He could see my potential, nurtured my talent and pointed me in the right direction. I have learned to paint from within, my best paintings come from really connecting with what I see and feel.